Tobi Saulnier gave a talk on how gamers can consider making Nintendo DS — the popular handheld game console — accessible for people with disabilities, particularly kids. Saulnier is founder and CEO of 1st Playable Productions in Troy, N.Y., just outside Albany, where she specializes in making video games for young children. Handheld platforms like the Nintendo DS are great learning devices for kids. They use a touch screen that operates via stylus or fingers, as well as tactile arrow buttons. But they have some limitations in terms of design for people with disabilities. 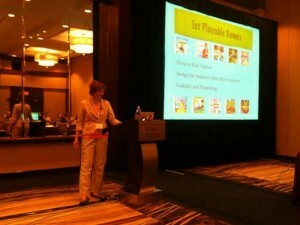 Saulnier tries to add accessibility into all of her games, which include Cabbage Patch Kids and Club Penguin titles. Her company also created Winter’s Tail, which is based on the book by the same name and follows the story of an animal heroine with physical disabilities.